The nation’s commitment to clean energy grabs most of the headlines, but China is also pioneering a massive high speed rail system that will help connect what will soon be some of the biggest cities in history. I don’t want to perpetuate the US vs. China who-will-be-the-economic-superpower narrative that’s already rampant in our press enough these days, so let’s frame this one from another, even simpler angle — China is doing a bunch of really great stuff in clean tech that we should be doing too. The nation’s commitment to clean energy grabs most of the headlines, but China is also pioneering a massive high speed rail system that will help connect what will soon be some of the biggest cities in history. And no, we don’t need to ‘beat’ China by building a similar rail system here in the states — we just need to ensure our transportation system is efficient, sustainable, low carbon, and decoupled from oil dependence. And fast. 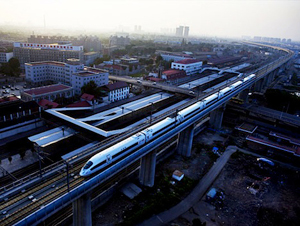 China already boasts a rail network that, including both standard and high-speed rail, is more than 53,000 miles long. And China plans for that network to reach 68,000 in 2012 and 75,000 by 2020. All of China’s provincial capitals have been connected by rail since the 1960s, and unlike the United States, rail is already a major mode of intercity passenger transportation. All told, China is investing $300 billion between now and 2020 in its extensive rail plans. Right now, the United States has barely committed $10 billion, though rail advocates were aflutter after Obama announced a plan to give 80% of Americans access to high speed rail by 2035, and followed it up with an outline for a $53 billion, 6-year plan (which has yet to be authorized). Meanwhile, many Tea Party Congressmen and conservative pundits are calling for rail plans to be scrapped — and some are getting their way. High speed rail projects, which double as job-creating, economic stimulus programs, have been blocked in Ohio, Wisconsin, and now, Florida. The governors of these states claim that the investment in the infrastructure of tomorrow will be too costly down the line, and have booted the federal funding, which would have created thousands of jobs in each state. Needless to say, we should be exercising more vision than this — with oil supplies dwindling, the airline industry will crumble, leaving air travel available only to the very rich. Our highways are congested across the nation, and many are in disrepair — high speed rail is a sustainable way to help relieve the burden. If you take the long view, high speed rail is perhaps the most viable long distance mass transportation option we’ve got on the table — it’s time to follow China’s lead on this one.